Hollywood couldn't have created a disaster scene more terrifying: A prodigious wildfire ripping through suburban streets and cul de sacs on the northern edge of Los Angeles's populous San Fernando Valley. The fires began Thursday night, in ritzy Montecito, near Santa Barbara. But ferocious, 70 mph Santa Ana carrying embers sparked several more fires late Friday, CBS News correspondent Bill Whitaker reports. Some residents fought all night to save their houses. "It got really bad about 6 a.m.," area resident Phyllis Patterson told Whitaker. "It was a blazing firestorm and the propane tanks were just popping." The Montecito fire has already claimed hundreds of houses and sent several people to the hospital. 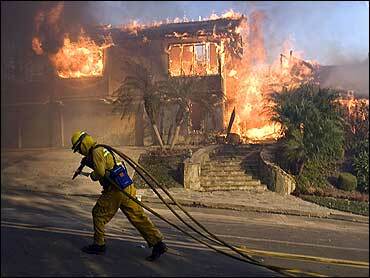 The worst of the new fires was in the foothill community of Sylmar on the edge of the Angeles National Forest. It quickly spread across 8,000 acres - more than 12 square miles - destroying at least 500 mobile homes at a trailer park. It was only 20 percent contained late Saturday. And it may have turned deadly. Los Angeles Mayor Antonio Villaraigosa says authorities suspect several deaths in the trailer park fire. Police Chief William Bratton said Saturday that cars were found in the debris, but police will have to wait until the ground cools to bring in search dogs. "We have almost total devastation here in the mobile park," Los Angeles Fire Capt. Steve Ruda said. "I can't even read the street names because the street signs are melting." Earlier Saturday, CBS Radio Station KNX reported that authorities have declared the Oakridge Mobile Home Park a crime scene and dispatched arson investigators. The series of fires has injured at least 20 people and destroyed hundreds of homes from coastal Santa Barbara to inland Riverside County, on the other side of the Los Angeles area. Smoke blanketed the nation's second-largest city Saturday, reducing the afternoon sun to a pale orange disk. As night fell, a fire fed by a sleet of blowing embers hopscotched through the winding lanes of modern subdivisions in Orange and Riverside counties, destroying more than 50 homes, some of them apparently mansions. The Sylmar blaze threatened at least 1,000 structures, city Fire Department spokeswoman Melissa Kelley said. Gov. Arnold Schwarzenegger declared a state of emergency in Los Angeles. Fire officials estimated that at its peak 10,000 people were under orders to evacuate, including residents of the mobile home park. Villaraigosa also warned that Los Angeles residents should be prepared for rolling blackouts as the fires have ravaged the city's electric grid. At an evacuation center, Lucretia Romero, 65, wore a string of pearls and clutched the purse and jacket she snatched as firefighters shouted at them to flee hours earlier. Her daughter, Lisa, 42, wore a bloodstained shirt and pants. A helicopter dropping water on their home caused the entryway ceiling to collapse. Debris scratched her forehead and gave her a black eye. Lucretia Romero said she saw smoke above the hills beyond the front door and then, within an hour, saw that a canyon across from her home was red with flame. "They would drop water, the water would squash the flames and then two minutes later the flames would come back," she said. Firefighters soon banged on the door and gave them 10 minutes to evacuate. Flames swept across the park and scorched cypress trees, Ruda said. Firefighters had to flee, grabbing some residents and leaving hoses melted into the concrete. Ruda produced a burned U.S. flag on a broken stick as a sign of hope and bravery for firefighters. "The home that this flag was flying from is gone," he said. Police Chief William Bratton said cars were found in the debris at the park, raising concerns that bodies might be found. Crews were waiting for the ground to cool before bringing in search dogs, he said. The Santa Anas - dry winds that typically blow through Southern California between October and February - tossed embers ahead of flames, jumping two interstate highways and sparking new flare-ups. Walls of flame raced up ridge lines covered in sun-baked brush and surrounded high-power transmission line towers. Mayor Antonio Villaraigosa said the fire caused problems that shut down power lines in places, and he asked residents to conserve power to help avoid possible blackouts. 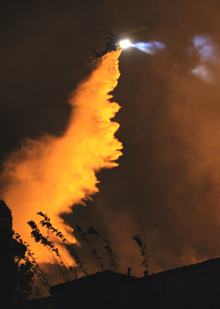 Shortly after midnight, the Sylmar fire burned to the edge of the Olive View-UCLA Medical Center campus, knocking out power and forcing officials to evacuate two dozen critical patients. Listen to live coverage from CBS News Radio station KNX. Several administrative buildings were damaged. The shifting winds caused the fire to move uphill toward the San Gabriel Mountains, downhill toward homes and sometimes skip across canyons. It also jumped across Interstates 5 and 210, forcing the California Highway Patrol to shut down portions of both freeways and some connecting roads. More than 60 homes were damaged or destroyed in a fire that erupted in the Riverside County city of Corona and spread west to the Orange County communities of Yorba Linda and Anaheim Hills. In addition, 50 apartment units burned in a complex in Anaheim Hills. Devin Nathanson, 27, had put down a deposit on an apartment there and planned to move in Saturday. Instead, he watched from the road as it burned to the ground. "At least none of my stuff was inside yet," he said. Palm trees lining the entrance to the complex were ablaze, and two firefighters manned hoses at the swimming pool and sprayed water on the leasing center. The roof caved in with a loud bang. About 2,000 acres - more than 3 square miles - were charred by that fire, with more than 12,000 people in 4,500 dwellings ordered to evacuate in Anaheim alone. Six firefighters were injured, including four Corona firefighters who were hurt when flames swept over their engine. Two of the Corona crewmembers were treated at a hospital and released. Winds began to decrease in the afternoon and were expected to drop further overnight, but humidity was expected to remain low. The night before, northwest of Los Angeles, more than 180 homes burned to the ground Thursday in Santa Barbara and the wealthy, star-studded community of Montecito, said William Boyer, spokesman for the city of Santa Barbara. The total could reach 200, he said. At least half of the area's 5,400 evacuees had been allowed to return home by Saturday night, he said. The fire was 40 percent contained, city spokesman Browning Allen said. Several multimillion-dollar homes and a small Christian college were damaged in Montecito, a town of 14,000 that has attracted celebrities such as Rob Lowe, Jeff Bridges, Michael Douglas and Oprah Winfrey. The cause of the fire is under investigation. At least 13 people were injured.